En-suite bath/shower room with bedroom 1. Bed rooms 2 & 3 with shared shower room Bedrooms 4 & 5 with shared shower room Separate guest shower room on upper floor. Main kitchen fully equipped upper floor. Notes on accommodation: Cot and highchair hire available. Sky TV is installed and wifi Outside: Impressive family pool. 1 BBQ area, outside chill out area, alfresco seating and dining for 16 and pool sun loungers, bar with sky tv and sound system. Cleaning / Towels / Linen / Maid service: Towels and fresh linens available on arrival for a weekly visit. Maid service and linen change once weekly on a 10/14 night stay. This villa is in a great location, has a spacious layout and amazing sunset views. 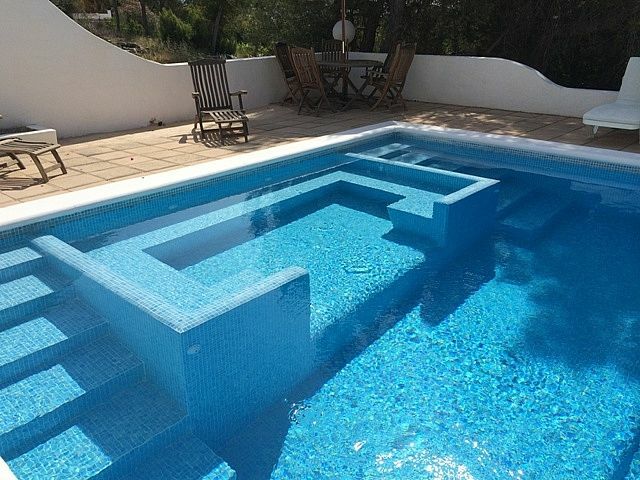 Perfect pool. Lovely spacious villa. Perfect for groups. Lots of Villa space so our group were not on top of each other. Huge pool. Loved the chill out bar and amazing sunset views. Everyone friendly and welcoming. Thanks for a great stay. Very big house with a lot of space, great pool , great location, close to every where ,quiet place for chill out ,no noise , perfect place to have fun and rest, martin was great and very helpful .i definitely recommend this place and we hope to go back next year . Grupo de 14 personas que estuvimos un finde. La casa está vieja, las ventanas no cierran y con la madera podrida.Las sillas y mesas, excepto la de la parte de arriba,están tan viejas que te acabas clavando astillas.El suelo del jardín está levantado y las luces solo se encendían 2 horas por la noche; al cuadro de luces no podías acceder porque había un panal de abejas. La limpieza escasa, encontrándonos maquinillas de afeitar de inquilinos anteriores en el jardín. Nos llamaron la atención por hacer ruido de 17 a 20 horas. Una lástima porque el entorno es bónito y con el dinero que le sacan podían restaurarla. San Antonio beach a 5 minute drive away. 5 minutes from San Antonio town and 10 minutes from Ibiza town. Wonderfully close to the busy town of San Antonio but far enough away for some peace and tranquilityand a short drive from the shops and restaurants of glamorous Ibiza town. Booking Notes: 50% of rental total needed on booking. The remainder to be paid 6 weeks prior to arrival. 2,000€ security deposit before arrival at the villa. Refundable in full where there is no damage on departure. Changeover Day: Sunday - Sunday changeover only. Flexible where possible.